If the patient has no proteinuria (protein creatinine ratio <50 mg/mmol), then the renal function should be currently stable. Renal deterioration will not occur until there is increasing proteinuria [1, 2, 3, 4, 5]. The exception to this would be a pure tubular disease, and I am assuming that this disease will have been picked up during the history, examination and other basic investigations. 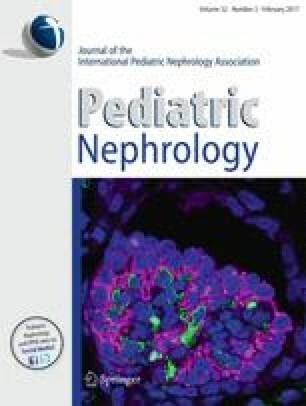 Patients with inexorably progressive renal failure tend to deteriorate at a rate proportional to their proteinuria , but generally speaking the more proteinuria, the more the rate of progression can be slowed by angiotensin converting enzyme inhibitors (ACEIs) and good control of blood pressure [2, 7, 8, 9]. We can now predict renal outcome and life expectancy with some accuracy, but data sources on life expectancy are few. The new information from Canada on life expectancy with CKD is very important but will need verifying from other parts of the world. We must not forget that collected data are often a decade old before they are analysed and published. While several long-term studies like CKiD [15, 16, 17] are running, it is still too early for them to have generated new information on life expectancy. However, trends in outcome continue to improve, suggesting that we can be more optimistic than current data suggest.